We have looked at the first verses, 2 Corinthians 10:3-4 where we learned our first general battle tactic. We are to stop trusting ourselves and our own methods. Only when we have done this, can we go on and adopt a new strategy to overcoming our enemy. There are two parts to our fight. Both these parts are important because of the enemy's devices and our problems. We must destroy those things that counter the knowledge of God. "We are destroying speculations and every lofty thing raised up against the knowledge of God..." (2 Corinthians 10:5a). We must make every thought subject to the teaching of Christ. 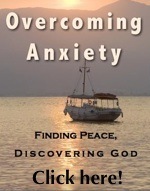 ".. And we are taking every thought captive to the obedience of Christ," (2 Corinthians 10:5b). Back in 1981, The Ladies Home Journal asked, "In whom do you trust?" I wonder what would be the results today?! From the scriptures we see that the battle is in what you believe! Belief and trust is the same. No wonder so many people face difficulties in life. They just don't really trust God. They don't read the Bible. This is where we see the importance of faith come in. We are not talking of belief in some empty religion but of a genuine trust in the living God. If we do nothing, we will not be freed. Next page.